Relieve and release the stiffness that comes from prolonged sitting--at a desk, behind the wheel, or on a meditation cushion--with these easy-to-follow exercises. 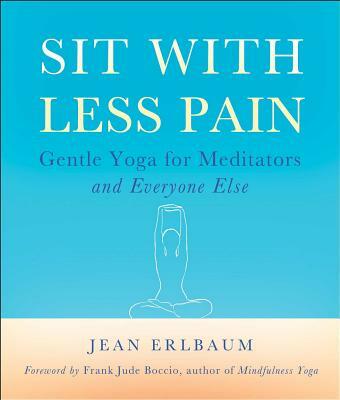 Jean Erlbaum, M.S., E.R.Y.T., L.V.C.Y.T, author, has been studying yoga and meditation since 1965 and has been teaching since 1972. An Experienced Registered 500-Hour Yoga Teacher, she is certified as a teacher of several styles of yoga, meditation, and stress reduction. She has studied Zen for over thirty years and in 2012 was designated as a senior Dharma teacher by Boundless Way Zen (Worcester, Massachusetts). She offers classes in Greenfield, MA, and Naples, FL, where she lives with her husband Richard Rumelt and their two dachshunds, Stella and Oscar. Richard and Jean have two daughters, Anna and Libby, who live in New York City. For more information about Jean, her classes and media resources, please go to www.yogaforrelaxation.org. Michelle Antonisse, illustrator, is an artist living in Los Angeles and an educator at the Museum of Contemporary Art. Her previous illustration work includes Veggiyana: The Dharma of Cooking (Wisdom Publications, 2011). Frank Jude Boccio, author of the foreword, is an interfaith minister who integrates the practice and philosophy of yoga, Buddhism, and Ayurveda. He is a certified yoga teacher/therapist through the Bateman Institute on New York City and is the author of the bestselling Mindfulness Yoga.